Cage-free chickens in a barn near Hershey, Pa., get to roam and perch on steel rods (but they don't go outside). In September, McDonald's said it would buy only cage-free eggs, inspiring several other food companies to follow suit. Animal welfare advocates got major traction this year pushing for cage-free eggs. In September, McDonald's pledged it would move to 100-percent cage-free eggs in its supply chain. And while the movement was already underway, this announcement seemed to really set off a domino effect. "I can't think of a social issue that food companies rallied around more in 2015 than chicken confinement," says Matthew Prescott, food policy director for the Humane Society of the United States, which has long been egging on producers and buyers to go cage-free. "I think what happened was that for so many companies, the cage-free issue had been on their docket for 10 to 12 years," says Prescott. But he says until McDonald's announcement, there hadn't been a commitment from a major player. 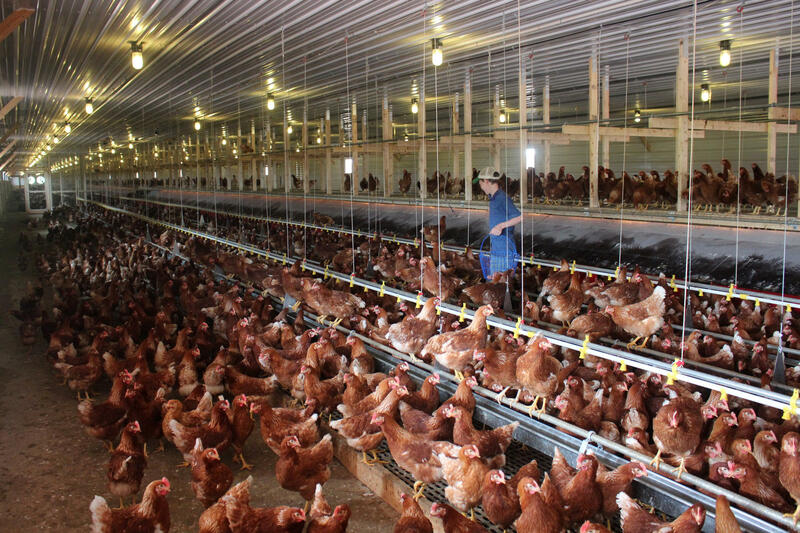 What "cage-free" means on the farm can differ somewhat, but as Dan Charles has reported, "enriched colony cages" that give chickens more room and nests to lay their eggs are currently one alternative to traditional cages among farmers. "They're finding out that those systems aren't as scary as they once feared," Chad Gregory, president of the United Egg Producers, the main industry association, told Charles in September. Prescott helped us compile this list of companies that committed in 2015 to buying entirely cage-free eggs (on a variety of different timelines). It's by no means complete, but includes most of the biggest players. Notice who's missing? With the exception of Costco, there are no grocery retailers: no Target, no Safeway, no Walmart. "They are the final frontier on this issue," says Prescott. But, he says, they don't have much of an excuse anymore — the biggest egg producers in the country are all eliminating cages, so cage-free eggs won't be difficult to source in the coming years. "We don't know of any producer in country unwilling to meet cage-free demand," he says. So it may only be a matter of time until retailers are no longer the eggception to the rule.